Want Some Of My Favorite Grilling Tips Techniques? Read On For 18 Useful BBQ Hacks To Try During Your Next Cookout. Even if you are an experienced griller with many a mouthwatering and fire-kissed meal under your belt, there are always new grilling tips techniques that can help make the experience go smoother. Truth be told, grilling can sometimes take a lot of work. From shopping and prepping the food. To cleaning and preparing the grill. This can add up to be a long and dirty job. One definitely worth doing I might add, but anything that makes the process a little more interesting or easier is worth trying. This is a fun and convenient BBQ hack that not only works for your BBQ grill but also is great for your campfire site or outdoor fire pit. The next time you buy eggs, save the cardboard carton (never use the styrofoam kind) and fill each empty egg space with a charcoal briquette. The closed cardboard carton is easy to light with a match or lighter. This will in turn light the charcoal. The cardboard egg carton also makes it easy to load up ahead of time for storage or to transport to a tailgate party or campground. Here are some more tried and true ways to light your charcoal grill that will make your grilling life easier. If you don’t have a grill brush handy, try cutting an onion in half and sticking it on a fork. While the grill is still hot, use the flat side to scrub the leftover food and ash off of the grate. The oils from the onion will make it easier to clean without having to scrub too hard and will add some flavor to your next cookout too. Onions are one of nature’s natural disinfectants as an added benefit. Another makeshift way to clean your grill grate if you do not have a brush handy is to use aluminum foil. Ball up a decent amount of aluminum foil, grab it with a pair of tongs and run it up and down on the grate while it is still hot. You can avoid most leftover food particles from sticking to your grates by rubbing a potato on them before you cook. Start by cutting a potato in half and sticking a fork in it. Pre-heat the grill. Rub the flat side of the potato over the grill grate. The starch from the potato will help keep your food from sticking. Another method to keep your food from sticking while grilling is by brushing nonflavored oil on the grate. Soak a folded up piece of sturdy paper towel in cooking oil, grab it with a pair of tongs and wipe down the grate completely. This will also help make the brushing of the grate easier at the end. On those extra cold days, line the inside of a charcoal grill with heavy duty tinfoil. This will help contain and reflect the heat. Make sure to make holes where the vents are to allow plenty of airflow. If your propane tank does not come with a gauge reader that tells you the amount gas you have left, how can you check? Start by boiling a pot of water and with your tank angled slightly to the side, pour the water over it. (Make sure you do not pour it over the top of the tank.) Run your hand down the side of the tank until you feel where it is still cool. This is where the propane level is. The empty side will be warm. If you are like most people who use your tongs for multiple tasks while grilling, this hack will prove useful. Use one set that has an insulated heat-resistant handle for moving and spreading your coals. You can use the second set for gripping, moving and turning your food. Now your food won’t get ash dust on it and you won’t be getting food grease on the coals. Want to add a little smoke flavor to your next cookout but only have an electric or gas grill? Make a pouch out of aluminum foil and fill it with the wood chips of your choice. Poke some holes in the top of the pouch with a fork and place it under the grate and on top of the fire. Close the lid and be ready for some smoky flavored goodness. Believe it or not, tortilla chips make excellent barbecue kindling. Try it out next time and be prepared to be surprised. 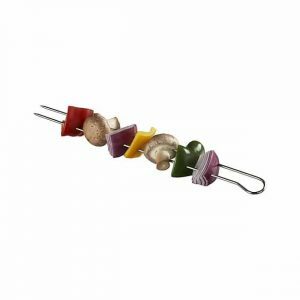 Everybody loves a shish kebab loaded with meat and veggies from the grill. But it can get frustrating trying to flip them over without the meat rotating with the skewer. Using double skewers will help keep the food extra secure and prevent the food from rotating when flipping them on the grill. Ever have a craving for shish kebab and only have wooden skewers on hand? Afraid the wooden skewers will burn and blacken on the grill? Try soaking the wooden skewers in water for 30 minutes before adding the food. This way the skewers won’t burn too badly. 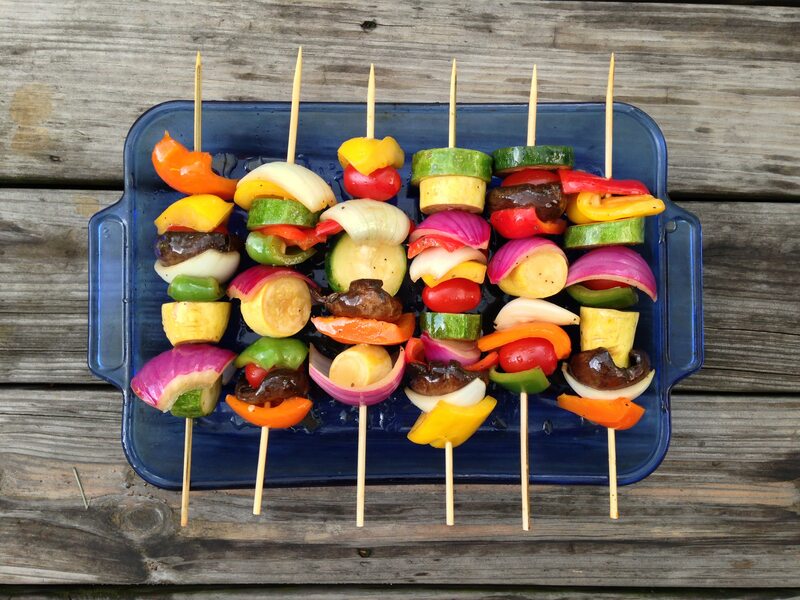 When most people think of shish kebab or grilled skewers, they think of lots of meat and a few veggies thrown in for color. Did you know that this is a great way to just grill veggies as well? I started out grilling veggies on the BBQ alongside the meat just to make my girlfriend happy. I soon fell in love the wonderful grilled flavor it added to them. Now, I am first in line for the veggie plate at our house. Another fun method when grilling shish kebabs is by using rosemary sprigs as skewers in place of wooden or metal skewers. Select the longer rosemary sprigs with the thickest stems. Remove the leaves from three-fourths of the sprig. Push the thick end through the veggies and meat. If you are having trouble, use a knife or metal skewer to poke a hole through the meat first. The rosemary will flavor the food from the inside out and fill the air with a wonderful aroma. Cinnamon sticks make great skewers for a tasty fruit treat on the grill. Especially fruits like plums, peaches, and nectarines. Start by quartering your fruit. Softly poke holes through the fruit with a wooden or metal skewer, then slide the cinnamon stick through. Want to spice up your next outdoor BBQ? Try sprinkling your favorite herb over the hot coals. Use herbs like basil, thyme, sage or my favorite, rosemary. It will help give your food an herby, smokey flavor. The neighborhood will smell great too. Is your barbecued meat coming out dry? Are you looking for ways to keep your meat moist throughout the cook? Fill a spray bottle with 100% apple juice and occasionally spray the meat throughout the cook. This will not only help keep the meat moist, it will help with the flavor and color. I get so frustrated when I am grilling a beautiful piece of salmon and when I go to take it off, it leaves half of itself on the grill. Place sliced lemons directly on the grill grate. Place your fish on top of the lemons for a perfect nonstick surface. Not only will you not leave any behind, your fish will have the wonderful lemony flavor added. Raw meat can harbor bacteria which may be harmful. Make sure to wash everything thoroughly after it has come in contact with uncooked meat. Be especially diligent when cooking with chicken or any type of ground meat. I hope you have enjoyed these 18 grilling tips techniques and it proves helpful to you. I also hope that you are one step closer to joining me in “The Grilling Life”! A lot of stuff I had never heard about!! Great detailed post, keep it up and thanks! Thanks Andi. I am glad you found them helpful. Let me know if there is anything else you may find interesting and I will be happy to include it in a future post. Happy Grilling! I am so glad you found my article useful. I have to improvise all the time as I am like you and often forget some of the essentials on my many trips. Thanks for the support. Don’t forget to check back in from time to time as I am always on the lookout for helpful tips or stories I can share. Happy Grilling! I found the one on how to check how much gas is left in the tank particularly useful. Great David. I am glad you found them useful. Hopefully you check back in from time to time as I am always on the lookout for helpful tips or stories I can share. Happy Grilling! Thanks again for stopping by. Don’t forget to check back in from time to time as I am always on the lookout for helpful tips or stories I can share. Happy Grilling! This is some good information about grilling, and a lot of ideas that I never really thought about! The potato on the grill to create a substitute for oil for example. Definitely will have to try the tortilla chips idea too! Thanks for your post man, real neat stuff, gonna bookmark it so I can come back to it next time I grill up some food! Thanks Jacob. I am glad you enjoyed it and I hope these tips will help you in the future. Thanks again for stopping by. Don’t forget to check back in from time to time as I am always on the lookout for helpful tips or stories I can share. Happy Grilling! When we purchased our new house, it came with a 60ft garden and I was excited at the prospect of having a barbeque party each Summer. 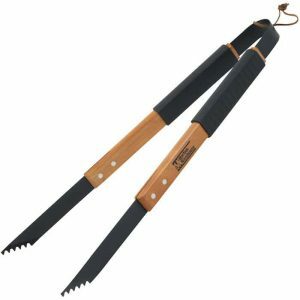 Each time I went to buy the equipment, they seemed so basic that I thought they won’t give me the perfect barbeque – not only that, the idea of cleaning the barbeque grill was daunting. However, since I’ve come across your site, I am even more inspired through the reviews and tips that I might just transit to a ‘grilling life’ this Summer should the British weather hold out!! I have bookmarked this site for future reference!! Thanks for a great informative site – didn’t know there was so much to grilling!! Summer is right around the corner so it is the perfect time to start shopping for the right grill for you. Let me know if you need any advice when it is time to buy. Thanks again for stopping by and happy Grilling!